AtlasLoot_Source is an official plugin for AtlasLoot, made by the AtlasLoot team itself, that shows the source of an item below its default tooltip. Although this addon closely related to AtlasLoot it does not require AtlasLoot to be installed! Shows the drop location of an item. Shows the source of an item (for example Midsummer Festival or Darkmoon Faire). 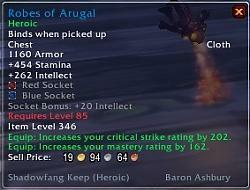 Shows the profession, skill and required reagents for a craftable item. Shows the costs of items that are sold by vendors. Shows the item ID (disabled by default). Currently there are no known bugs. A special thanks goes to pceric! IMPORTANT NOTE: Please remove any old folders before installing v0.3. Updated database with new 4.3 items. 500kb ??? it's a joke? for an addon which must be tiny (it's only a plugin which add some info in tooltips, not a big addon like Atlas or Xperl...), it's really too much, I don't even give a try. Old AtlasLootReverse weights only 50kb. Any updates on the "Crafting Info" bug? I want to know which profession items come from but not the crafting materials. However disabling the option does not last through a /reload. I love the concept of having the materials for an item right on the tooltip, however, this is a bit much. Can we clean this up a bit? Maybe stack the reagents? Thanks! What this change does is replace every ", " in string with ",|n" which turns single line reagent list into multi-line. Will try it now. Thanks for the help! I tried disabling the "Crafting Info" option for the tooltip but after a /reload or game restart the option re-enables by itself. 4.3 update is finally out. We have renamed the addon to AtlasLoot_Source as it fits much better. The addon remains in beta status because there are still many bugs to fix. We are also revamping most of the code base to make it easier to update. Stay tuned for more in the coming weeks. I think, scratch that, I know this needs an update. It lists the old VP items as VP rewards and all new loot in 4.3 is missing. I am noticing the same as well. Anything new to 4.3 is missing a reagents listing. it doesn't work with several items. e.g. it doesn't show where the avenger's rings come from. it does work with regular bosses drops. Should be fixed with v0.2!